The Indian automobile brand – Tata seems very close to launch their latest sub-compact SUV Tata Nexon very soon. Read on to know everything about this upcoming compact SUV. 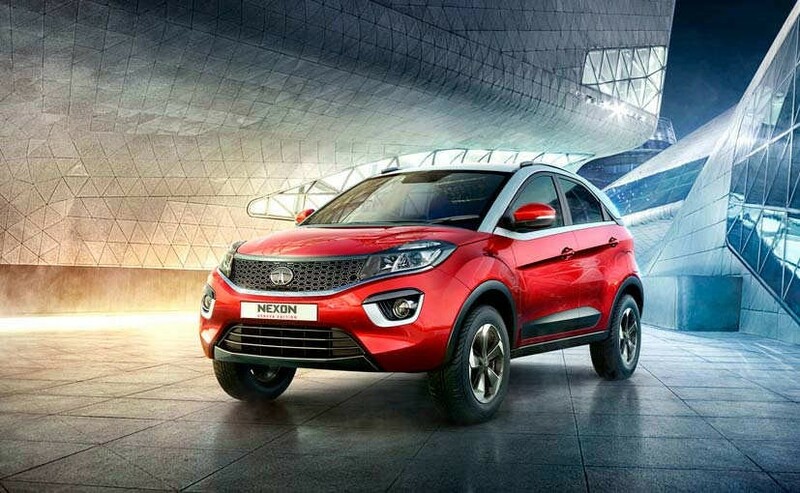 TATA – the leading Indian automobile brand is all-set to heat up the sub-compact SUV segment with their next big launch Tata Nexon in India. Recently, the company has officially flagged-off the first batch of their highly awaited compact SUV Tata Nexon from the Ranjangaon facility. This is Tata’s fourth car based on their IMPACT design philosophy. Moving ahead, the Tata Nexon will soon start reaching dealerships across the country in a phased manner. The engineers at Tata have left no stones unturned while conceptualizing, designing and manufacturing the Nexon. The Tata Nexon features are built with a strategy to rule the sub-compact SUV segment, and it will definitely offer a tough time to Maruti Suzuki Vitara Brezza, which is currently the best in the segment. And when it comes to the great Tata Nexon Specifications, Tata seems to have an advantage. Let’s have a close look at the all-new sub-compact SUV – Tata Nexon. Tata Nexon sports a next generation compact and sporty SUV design, which attracts your senses on one go. The dynamic, bold and impactful design on the Tata Nexon will add an advantage to this SUV. The Tata’s IMPACT design philosophy seems working and Tata seems winning in this segment with a great margin. And if you don’t pay close attention to the front look, it might even don’t look like any other Tata car. The Tata Nexon would attract a lot of young SUV buyers with its next generation philosophy design, and the added sportiness is a treat for all. The excellence of the exteriors is being carried on the inside as well. Going with the images we saw till date, it can be clearly seen that the interior design, dashboard, controls, comfort, convenience and entertainment features add here are simply top of the class. Thanks to the futuristic design, the cabin seems to be of any up-segment SUV, which makes the Tata Nexon best in the segment. The leather seats, fabric and plastics used here and there seem to be of premium quality, and we believe the comfort level would also be best in class. On the centre, there is a touch-screen infotainment system which we believe would support Apple CarPlay and Android Auto connectivity. The list of Tata Nexon Specifications would be quite long. The Tata Nexon would be available with two engine options – petrol & diesel. The petrol variant will get a 1.2-litre three-cylinder turbocharged petrol Revotron motor, which churns 108bhp of maximum power at 5000rpm and 170NM of maximum torque. The diesel variant gets 1.5-litre four-cylinder Revotorq diesel engine that churns 108bhp of maximum power at 3750rpm and 260NM of maximum torque between 1500-2750 rpm. The Tata Nexon SUV features all-new TA6300 6-speed transmission. These engines will come with three driving modes – Eco, City and Sport. The Tata Nexon is expected to be priced between Rs.6.50 lacs to Rs.13 lacs (Ex-Showroom, New Delhi). Tata may launch their all-new compact SUV Tata Nexon during the upcoming festive season in India. Do you think Tata Nexon is better than the Maruti Suzuki Vitara Brezza? Do your thoughts comments and feedback in the section below.